New container -Your choice of 2 Wines and a nice assortment of goodies, makes this a nice gift to send for any reason. Approx size 13"x 9"x 18"
Elegantly wrapped with ribbons, hand crafted bow and a note card with your message. · Gifts for Every Reason, is fully licensed to purchase and deliver alcohol on behalf of customers according the rules set by the LCBO. · Proof of Identification AND an Adult Signature is required upon delivery to ensure recipients are 19 years of age and older. Minors CAN NOT accept delivery. 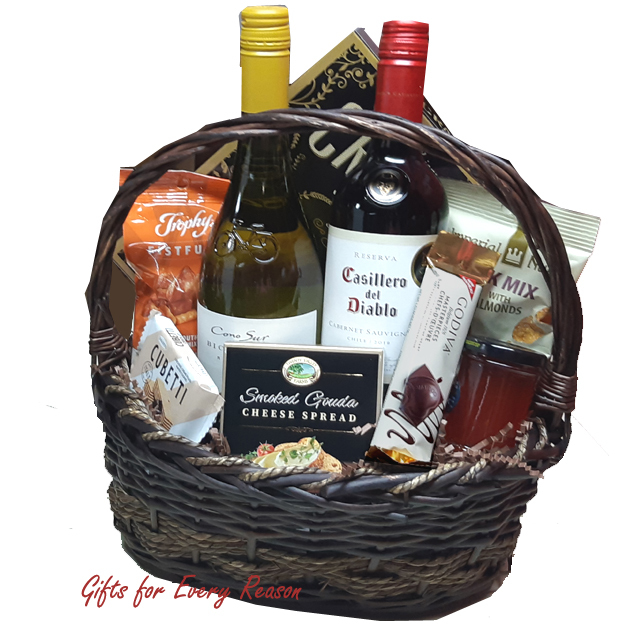 · Alcohol Delivery fee is included in the price of this gift. · Alcohol is purchased the day of delivery. We do not store alcohol on the premises. Great mix of cheese crackers dip with 2 nice bottles of wine. Arrived at the office, very nice presentation. Received wow's from everyone before we handed it over to the client.